The last time I wrote a live report, I went to the United States for the first time to see B’z for the first time. This year, I finally had saved enough money to be able to go to Japan. It was a huge dream of mine to be able to attend the PLEASURE 2013 tour. And so I made my way to Japan on September 6th. First time in Japan, first ever Pleasure concert experience. I was so excited. Read on after the break as it’s incredibly long! On the day of the concert I met up with a very dear friend of mine and we went to the Hard Rock Cafe in Osaka to have lunch before we would head to the Kyocera Dome. This was actually the very first time in a Hard Rock Cafe for me. I really enjoyed it, though, because this Hard Rock Cafe in Osaka is very special: It has Tak Matsumoto’s guitar on display! 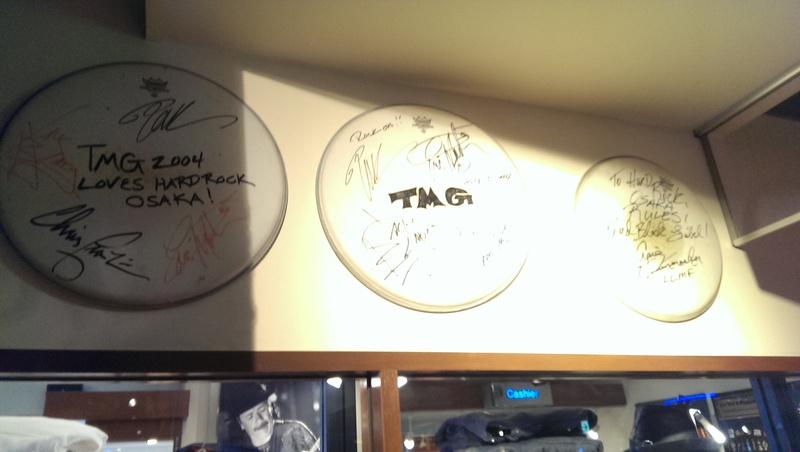 And also autographs by Tak Matsumoto Group (TMG) are on display. We weren’t the only B’z fans to make their way to this particular Hard Rock Cafe. A lot of fans took pictures in front of the entrance. 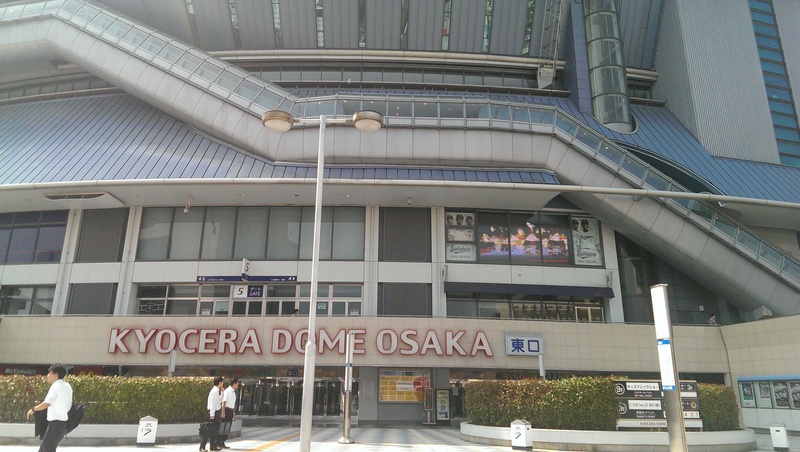 Once we had finished lunch, we made our way to the Kyocera Dome by train. Although it was about 1PM, a lot of people already gathered at the venue to buy merchandise and try their luck at the Gacha-gacha slot machine. 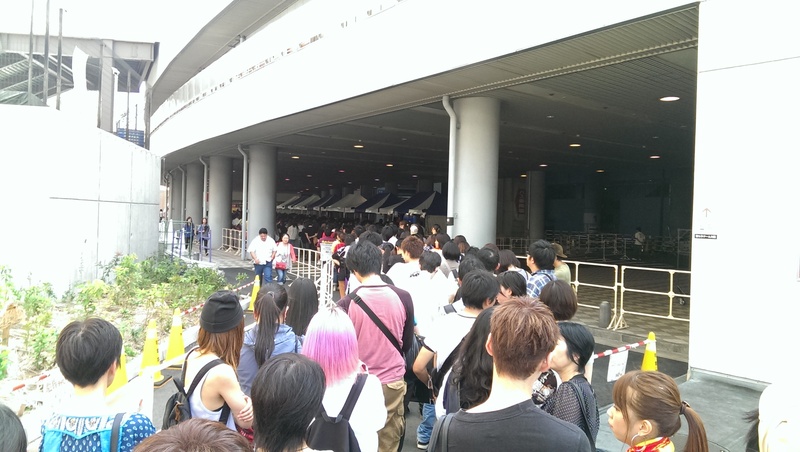 We also got in line for the merchandise and it was very tough because it was very hot that day. Fortunately, the line moved very quickly so we were waiting in the shadows until we got to the merchandise booth. Next to the merchandise booth was the CD/DVD booth. You could buy B’z albums, singles and live dvds there. Additionally, you could buy the support member’s solo works such as Shane Gaalaas latest album “Ascend”. After we bought the merchandise we wanted, we made our way around the dome to find the infamous tour trucks! It took us quite a while but we were able to locate them. Unfortunately they were parked across the street so we had to take pictures from afar. Before we entered the actual venue, we went to the shopping mall in Kyocera Dome to take pictures of Tak’s and Koshi’s handprints! They are put on display there. Once the doors opened at 4:45PM, we made our way to the gate specified on our ticket. As we entered, the person at the gate scanned our tickets and handed us our seat reservation ticket. Luckily we got tickets for the arena! But we were in block E, so we wondered where that would be… and, although it was not very close to the stage, we were still satisfied with our seats. It was not too far away. And the screens provided us a chance to see everything up close. While we waited for the show to start, they were showing old performances by B’z on the big screens. Even some rare ones! That was my first time seeing footage of the opening of B’z LIVE-GYM 2003 BIG MACHINE!! Hopefully they will release that footage someday… As time passed, the dome began to fill up with people and soon enough, the announcer would proclaim that the band would be on stage in just a few minutes! That alone already got the crowd excited as hell. A couple of moments later, the lights went dark and everyone was on their feet. 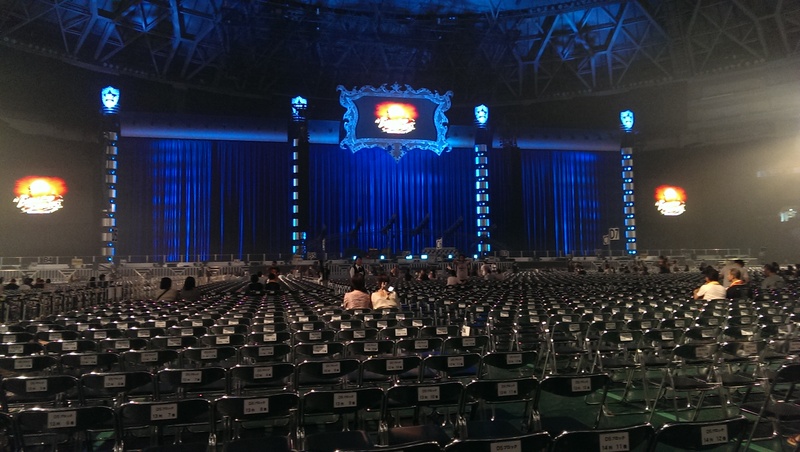 As usual with huge B’z LIVE-GYM productions, we watched the opening to the show. The song that was played during the opening is called “OVERTURE” and was composed by Tak Matsumoto himself. It was a very playful melody. Some say it sounded a bit like Disney music. As the music played and lights flashed and changed colors, poles would move up which would later form “XXV”. Then the lights went dark again and we could hear Tak Matsumoto’s guitar as he plays the intro to Endless Summer, a new song composed for the tour. Koshi would make his way to the stage by an elevator and at the same time, the “XXV” would be set on fire and Koshi began singing the new song. Endless Summer is a hard-rock song and is unlike previous B’z songs. I liked it very much! Also, Endless Summer is a very fitting title in my opinion as “heat” came to my mind when I heard the melody. 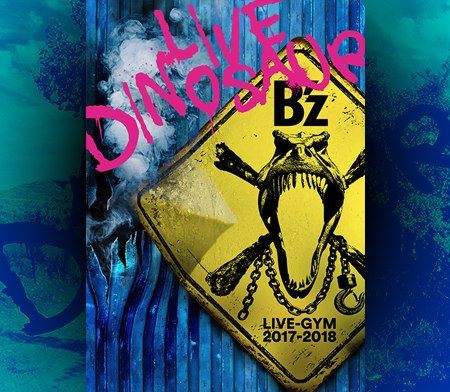 Endless Summer was followed by ZERO and after that, Koshi would start to do the usual “B’z no~”, but he wasn’t able to shout the whole “B’z no LIVE-GYM ni Youkoso!”. Why? Well, because Tak was always interrupting him! It’s kind of the same setting as during Ain’t no Magic. It was still funny as hell, though. Tak was then swinging some thing around, tempting Koshi to pull on the other side. 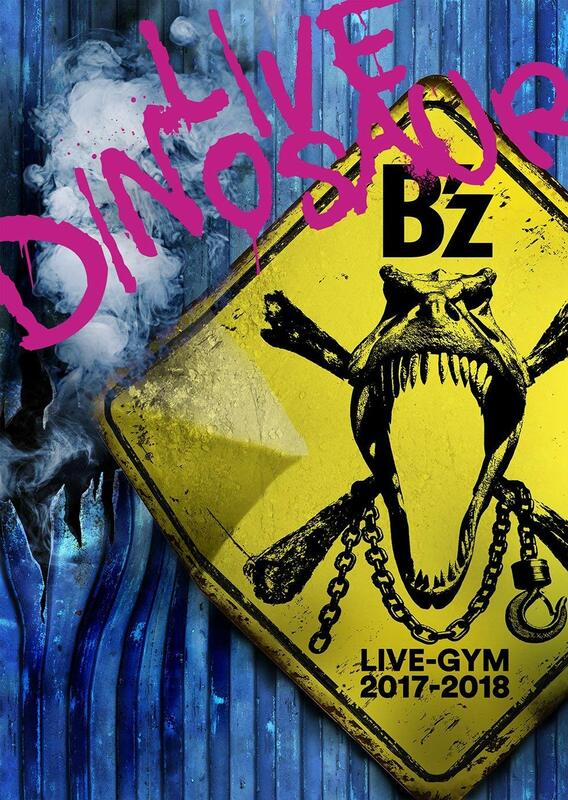 When he decided to pull it out, it would reveal the text “B’z no LIVE-GYM ni Youkoso!”. He would throw it off stage and shout B’z no LIVE-GYM ni Youkoso! which then transitioned into Pleasure 2013 ~Jinsei no Kairaku~. The lyrics for that particular song changed again, but I couldn’t make them out, unfortunately. We will have to wait for the official DVD/Blu-ray release! Further into the show, Tak debuted one of his new solo songs, “Rain” as an interlude between songs. It sounded very nice and has an Asian touch to it. Also, it sounded very mysterious. In addition to that, they showed footage of what could possibly be the music video to the song in the future. After performing Kakushin, Koshi asked the audience what comes to mind when they think of summer. Everybody was screaming different things such as “Ocean”, “Fireworks”, etc. But what Koshi actually wanted to hear was “camp fire”! And so they had a little camp fire lit up on stage with every band member on an acoustic guitar. And so they would perform Aikawarazu na Bokura. Even Shane and Barry would sing parts in Japanese. It was really great! And a rare song, too! Later on, an airship made an appearance during Ai no Bakudan to distribute hearts within the dome. I tried to catch one, but it flew farther away. Too bad! When the band performed Q&A, Samurai and Ninja made it onto the stage. The performance was very awesome, indeed! Flames shot out of the edge of the stage for maximum hype. Before breaking out into RUN, Koshi declared that we, the fans, are the band’s motivation to keep going and that he is very thankful to us fans! And that concluded the main part of the show. While we were waiting for the encore to start, everyone was doing the waves. It was really fun! After a couple of minutes, the lights went back on and the band came back on stage… Koshi shouted “OSAKA!!! DO YOU STILL HAVE SOME ENERGY LEFT?” and we would reply to his question with a loud “YEAH!!!”. Koshi then shouted “SO LET’S HAVE SOME MORE FUN! !” and the intro to juice started. But this time, Koshi did not have us shout “HEY HEY HEY” but “YO YO YO”. That was kind of funny, haha. The show then concluded with ultra soul as the last song. After the show ended, we made our way to the train station to get back to central Osaka. However, there were so many people and, additionally, the train was delayed indefinitely due to a blackout. What a bummer! So we had to find a different route home since we didn’t feel like waiting forever at the station. But eventually we made it home! All in all, I have to say that a dome concert is a whole different experience compared to the small hall shows. The production is completely different and it doesn’t matter where you are in the dome, B’z does everything so that every person in the dome enjoys the show as much as the ones in the first row right in front of the stage. I would definitely go again! Congratulations!! What a beautiful trip! Thank you for this report! And I hope you can fly back soon to Japan! Awesome report. Glad to see you had fun. Congrats. I want to hype for a new single or album with Endless Summer and Overture on it! Hype! Hype! I am happy you could go see them live! BUT I feel sorry for the poory guitar – such a beauty encaged behind glass and beeing tortured by light – I know it should be on display but that looks so damn painful to me. Now I am waiting for the date of this Live-Gym BluRay. I will preorder it as soon as it’s available. Oh yeah and any infos about Tak’s new solo stuff ? No news on his new solo works so far, but we will post them as soon as we know something!